516Ads.com & 631Ads.com is proud to team up with The Babylon Town Chamber of Commerce and event sponsors Marie Cantone - Changing Hands, Jo Haramis - Floors Decors + more & Tai Vicari - NMS - Network Marketing Specialists for a top quality morning of smart business No fee - just pay for breakfast! Hope to see you there!!! 516Ads & 631Ads is proud to team up with our friends from LIEXPO, Shoes for All founder Dr. Mary Carlson, DPM - Foot & Ankle Specialist and event sponsors Jeff Chapler - Clear Choice Construction, Frank Codospoti, Rennie Gonzalez - OMG Shower Doors, Cindy Manzolillo - Century 21AA & Jill Sheinberg - Chase Dental Sleepcare/ National Dental Management for a BIG TIME night of networking @ Ciao' Baby/ Massapequa! Let's make it a great one!!! Hope to see you there!!! 516Ads.com & 631Ads.com is proud to be teaming up with Roger Kahn - Champion Office Suites and event sponsors Wendy K. Goidel, Esq. - Goidel Law Group PLLC, Jamie Latinsky - American Express, Sarah Samuels, M.A., M.Sc. - Samuels Mediation & David Warshaw - The Wealth Plan for a top notch morning of smart business/ networking @ Champion Office Suites. Make connections, build relationships, learn from the best ... hope to see you there!!! Building A Resource! What Do You Need? 516Ads/ 631Ads ... what do you need? 516Ads.com & 631Ads.com is proud to welcome our newest members/ sponsors Nikki Adams - People's United Bank, Doris M Aptekar Ph.D. - Psychotherapist/ Certified Hypnotherapist, Dawn Cameron - Prospect Mortgage, Anna Carusos - NEW YORK ABSTRACT SERVICES, INC,, Debbie Forth - Holiday Inn Plainview, Mark Kuat - Liquid Capital Funding, Diane Landau - Memories on the Move, Tim LeFebvre, Esq.- LeFebvre Law, PLLC, Sarah Samuels, M.A., M.Sc. - Samuelsmediation.com, Stephen Seligson - Molloy Bros. Moving & Storage & Nick Vaglica - Nationwide Insurance. Thank you ALL for your business and support. We appreciate the opportunity to network and promote your services!!! Props to our friends @ IBA - Island Business Affilates, Inc. They hosted a well attended top quality night of networking @ Bertucci's/ Hauppauge. Great people, great energy, excellent connections, thanks IBA!!! Thanks to all who came out!!! Johnny Sax: Get Paid to Shop! Change doesn't happen unless you make it happen. If you're looking to follow your passion; and create additional streams of income this is the event for you. Please click here or contact John Mangione - 631-513-5382 for more information/ RSVP. If you're looking for a one-per-industry networking group, find out more about Reliance Business Group. Excellent group of professionals meet Wednesday mornings 7:30 AM @ Candlelight Diner. Robert Cox runs an excellent meeting. RSVP a must!!! Contact Rob 718-767-2326 for more information/reserve your seat. Please join Angela's House Thursday, March 31st from 7pm - 11pm at Watermill Caterers as they celebrate another wonderful year of working in and with the Long Island community. The more you know about Angela's House the more you want to help. We are proud to do the little bit that we can to promote their efforts! Please click here for sponsorship and ticket information. Starts on 4/4/16 from 5:30-7pm. FREE! 4/4/16 - Grow Your Email List: Quick, easy ideas to expand your reach. Come to Panera's in Port Jefferson Station to learn powerful and effective practices to promote your business through digital marketing. Each workshop includes networking with other local business professionals. You can choose 1 or all 6 workshops. All are held on Monday evenings from 5:30pm- 7pm. Register here! For questions, call Sue Glenn, Constant Contact Authorized Expert, 516-574-3790. Mastermind Discussion Topic: The Woman’s Road to Success - Blazing the Path for Your Totally Freakin’ Awesome Life! Questions? Call Team WPN at 954.370.1176 or click here for details! please click here for sponsor/ exhibitor/ ticket information. 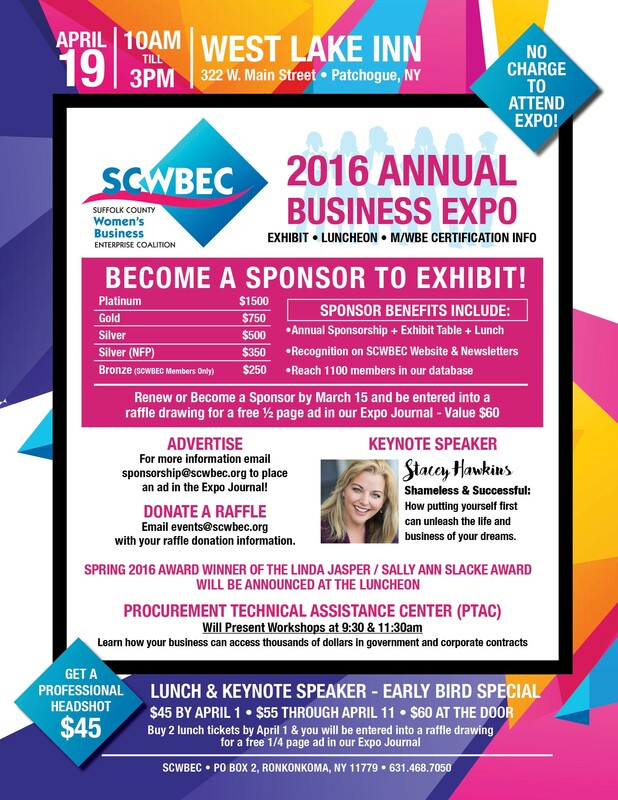 Independent Business Women’s Circle (IBWC) will be hosting their Annual Expo! Exhibit your goods and/or services at the Marquis Café in Glen Cove. If you’d like to participate as a vendor, please click here to register and pay for your table. For more information, call Karen Bomzer at 631-754-6640. Free to attend. Please help support the Long Island Alzheimer's Foundation. Enjoy An entertaining afternoon with excellent networking opportunity for a great cause. For more information please visit The Long Island Alzheimer’s Foundation - www.liaf.org or call (516) 767-6856. ATTENDEES: JOIN the Suffolk County Women's Business Enterprise Coalition for exhibits, certification workshop, business head shots, raffles, networking and inspiring lunch Keynote Speaker Stacey Hawkins. NO CHARGE to attend EXPO or workshop. Luncheon tickets $45.00. Purchase 2 tickets by March 31 and be entered to win business card-sized ad. Tickets at: http://bit.ly/1WIYJZW. EXPO details at www.scwbec.org. For ticket/ sponsor information please click here or contact michael@eventmanagement.org - 516-426-1184 for more information. Sponsored by: Matthew J. Klieger. Esq. I am looking for another professional to join my team. I have 4 Independent Contractors now. It is commission only. They have to have a passion for travel, good sales background and interest in learning the travel business. If you or someone you know are interested please contact me. Dates are booking daily for the 2016 season! Give us a call today to reserve your special event party or fishing charter! 30 to 150 guests. Party Boat Central - (516) 378-0555. PinkTie 2016 - May 9, 2016 6PM - 11PM @ The Crest Hollow Country Club! A premier Long island event! Please click here for more information. Elinor & Claire have a booth .... stop by and say hi!! !